It was nearly a year ago that I began to think about hosting a blog event focused on Alfred Hitchcock's Vertigo. I had just read an English translation of the French noir novel the film was adapted from and wanted to blog about it. But to simply write a book-to-film piece didn't appeal. And a straight-ahead review struck me as not only daunting but - redundant - so much has been written on Vertigo by so many over the years, beginning with France's Cahiers du Cinema set 50+ years ago. So, I thought it might be interesting to try something different. What evolved was "A Month of Vertigo," a more-than-a-month-long meditation on the masterpiece from many angles by many bloggers. This turned out to be much more work than I ever anticipated - and much more rewarding than I ever imagined. 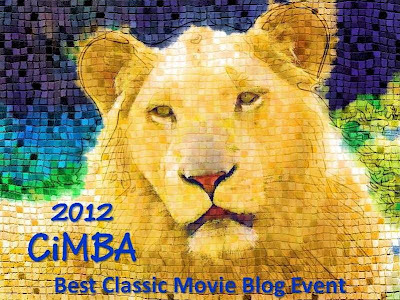 The icing on the cake has been the honor of being voted a 2012 CiMBA for "Best Classic Movie Blog Event" by the Classic Movie Blog Association. R.D. Finch of The Movie Projector, who kicked off "A Month of Vertigo" on January 1, 2012 with "Deadly Obsession: Alfred Hitchcock's Vertigo," a reflection on the film's structure and themes. Whistlingypsy of Distant Voices and Flickering Shadows who offered her contemplation of "Bernard Herrmann ~ Composer of Haunting Music and Treacherous Dreams." Blogger and author Christian Esquevin (Silver Screen Modiste is his blog, Adrian: Silver Screen to Custom Label is his book) who explored "The Costumes of Vertigo." Brandie Ashe of True Classics, who assessed Kim Novak's greatest role and performance with "Kim Novak in Vertigo: A Hypnotic Presence." Michael Nazarewycz of Scribe Hard on Film, who considered the film's iconic setting with "More Than Just the Streets of San Francisco." Author Steven DeRosa (Writing with Hitchcock), expert on the Hitchcock screenwriters and screenplays, who explored the story behind Samuel Taylor's best known screenplay with "An Inconsequential Yarn." John Greco of Twenty Four Frames, who had recently interviewed award-winning biographer Patrick McGilligan about his new Nicholas Ray bio - and interviewed him again for our event on the subject Alfred Hitchcock, about whom McGilligan had written a 2004 biography, and Vertigo. Allen Hefner of Bit Part Actors, a man who knows his supporting players well, who took a closer look at some of the film's unsung character actors (and more) with Vertigo, The Bit Players. Brian/Classicfilmboy of Classicfilmboy's Movie Paradise, who examined one of James Stewart's greatest performances with "James Stewart: A Walk on the Dark Side." Brandon Kyle Goco who contributed not only the promo but also the vlog (video blog), "Vertigo: Alfred Hitchcock's Edifice to Obsession." Vertigo authority Dan Auiler, author of the definitive VERTIGO: The Making of a Hitchcock Classic, who wrote of the film's mesmerizing impact with "Vertigo for Life." Joel Gunz aka/the Alfred Hitchcock Geek, who meditated upon one moment of the film with "Hitchcock's Most Beautiful Shot Ever; Or, A Single Frame So Good, 2,000 Words Don't Do it Justice." Thank you to the members of CMBA for honoring the blog event, the contributors and Vertigo with this deeply appreciated award. Click here for the complete list of 2012 CiMBA award winners. Congratulations on your award and to all your contributors to the event. It was a great series. Thanks, Jacqueline. It seems that 2012 became the year of "Vertigo." 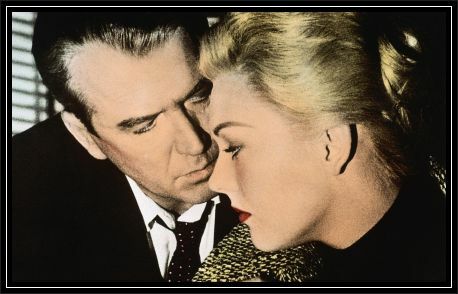 The timing of this event turned out to be perfect - "Vertigo" has been screening around the country all year and then, just recently, was named "the greatest" in the Sight & Sound critics poll. I can't prove it but I think Vertigo was changed to the #1 slot after your stellar event. : ) Yes, you are that powerful and esteemed. Now I'm wondering what you've got in that clever head of yours for events in the future. Page, Thanks and congratulations to you on being honored with a CiMBA for your in-depth and fascinating profile of Thelma Todd. Congratulations Lady Eve - it was a brilliant idea and you worked vtirelessly to make it all work so smoothly.It was a pleasure for me to particapte, but big kudos to you! Thanks, Christian - your contribution to the event, "The Costumes of Vertigo" is one of the most popular posts I've published on this blog - which speaks to its scope and quality. "A Month of Vertigo" was my idea of entertainment: thoughtful, heartfelt and free-ranging in the different writer's perpectives. A great work of art inspires and this was an opportunity for people to dig down into themselves and express their take on this masterful film. If they're going to give awards then you definitely deserve one, Eve, for your well-organized and well-timed effort. Thanks, MCB, it was a major undertaking, but "Vertigo" is one of those rare films worthy of a month+ long homage. Dan, it's very likely that if not for your book there would have been no "A Month of Vertigo" - thanks for the inspiration - and a wonderful resource. Congrats, Eve. You certainly deserve the award for all the work you put into A Month of Vertigo. It sounds easy...just get a few other writers to send posts to you, and then copy them in a particular order. But I know different. You were able to choose the posters based on their individual strengths. You chose a list of subjects to cover, and you made sure to cover everything, right down to the cars. Vertigo is a movie that can be analyzed on so many levels, and you did it all. I was very fortunate to be included. You were the star and we, the Bit Actors in the event. Thanks again. Thank you, Allen, your piece on the supporting players - and vehicles - of "Vertigo" added a fascinating perspective. Thanks so much for a great contribution. A well-deserved honor. Congratulations, LE. Congratulations Lady Eve for the well-deserved honor on your "A Month of Vertigo" blogathon. I can echo the sentiments of other contributors in saying it was a pleasure and a privilege to be part of this extraordinary event. The seemingly effortless nature of this labor of love was due to your tireless work behind the scenes. Thanks again, I enjoyed being part of your tribute to one of Hitchcock's iconic film moments. In a not entirely on the subject segue, are you looking forward to the two films based on Hitchcock: the making of "The Birds" with Toby Jones ("The Girl") and "Psycho" with Anthony Hopkins ("Hitchcock")? Gypsy, I generally don't like biopics and, though both men are very talented actors, what I've seen of Anthony Hopkins and Toby Jones as Hitchcock hasn't been very compelling. I'll definitely watch "The Girl," an HBO presentation, but don't think I'd venture out to see the Hopkins movie (though I'm sure it will end up on TV at some point). I read a bit of the recent NYT interview with Tippi Hedren and think she may be delusional in imagining that the director prevented her from becoming a major movie star. I don't think she had the talent to advance much beyond the mannequin-esque performances she delivered in "The Birds" and (ugh) "Marnie." Thanks for helping make "A Month of Vertigo" such a rewarding project, your piece on Bernard Herrmann was wonderful. Congratulations Lady Eve!! For the "A Month of Vertigo" blogathon. It truly was an amazing journey.. Vertigo, truly is one of the best movies of all time. Congratulations! It truly is a film worthy of a blog event. Thanks, silverscreenings. I saw "Vertigo" on the big screen for the first time about a month after the blog event - and was even more impressed by it, if that's possible. The theater was packed (3000+ seats) and the gasps that followed the final scene indicated that there were many who were seeing it for the first time ever. The applause and cheers that erupted at the end were another indication of how much "Vertigo"'s reputation has risen in the 54+ years since its release.